Pheasant is a tricky bird to prepare, because it very easily becomes tough and dry. Sous-vide comes to the rescue, because only perfect temperature control can assure you to get it tender without drying it out. If you’ve read my posts about understanding meat (click here for juiciness, here for tenderness and here for succulence and flavor), you’ll understand why the breast and the leg need a different time and temperature to be perfectly cooked. To be juicy and tender the breast would only need an hour or so at 55C/131F, but because pheasant is wild game, for food safety reasons the meat needs to be pasteurized and so I cooked it for 3 hours at 55C/131F instead. The legs require 18 hours at 74C/165F to become tender. 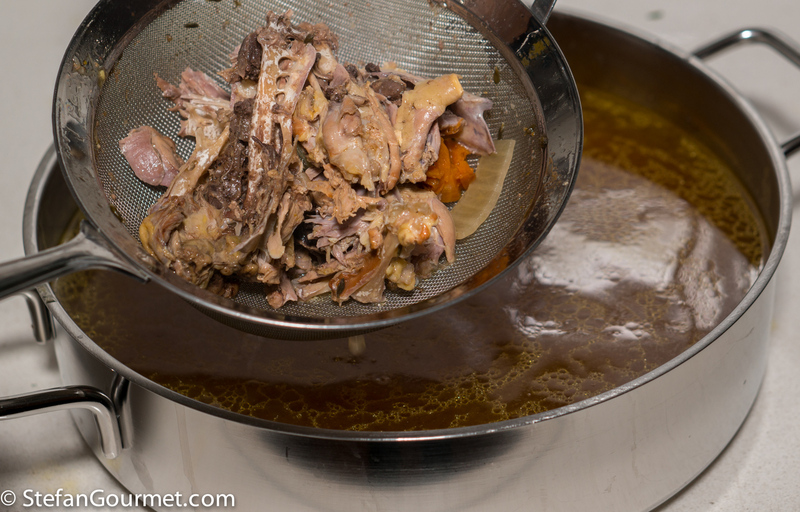 For this recipe I used all of the pheasant: besides the breast fillet and leg I used the carcass to make stock, which was subsequently reduced to obtain a flavorful pheasant jus. 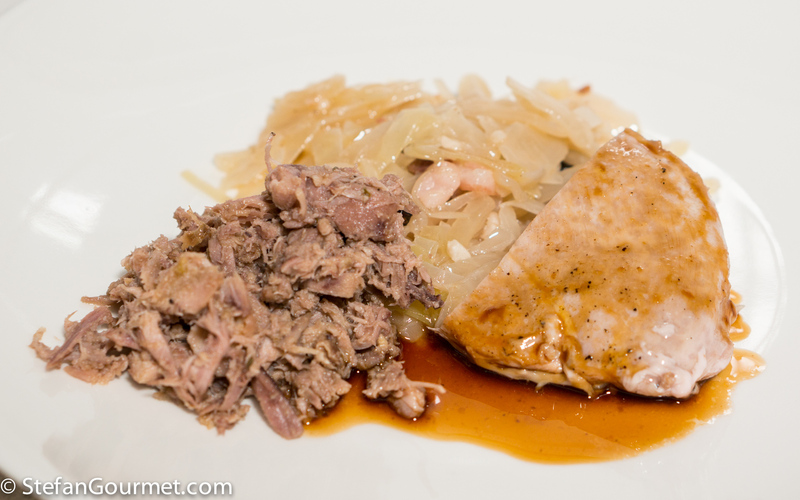 And I used the fat from the pheasant to sear the meat as well as for the sauerkraut (pheasant combines well with sauerkraut, for which I used homemade sauerkraut). So although the preparation of this dish is quite elaborate, the list of ingredients is very short. When shopping for pheasant, make sure that the pheasant you buy is female because their meat is tastier. It is also important that it is actually wild pheasant that was shot rather than farmed, because due to its diet of berries and herbs, wild pheasant has a much more interesting flavor. The only drawback is that you may encounter some tiny bullets and that sometimes the bullets have damaged the meat somewhat. 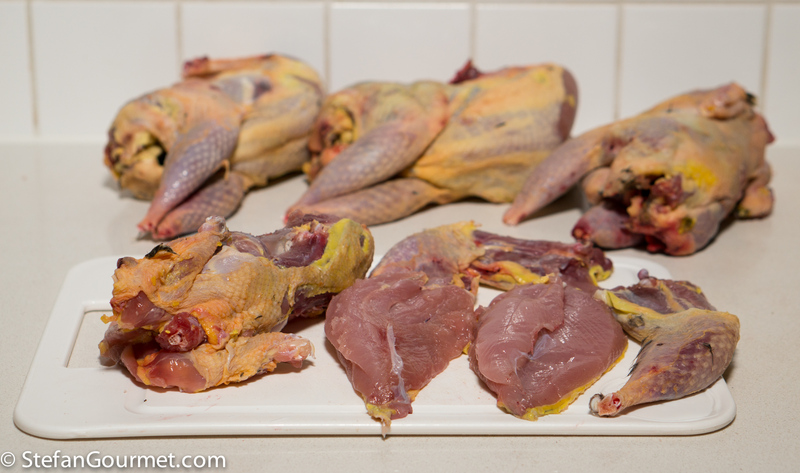 Separate the breast fillets and legs from the carcass of each pheasant. Remove any feathers that have been shot ‘into’ the meat. Gather any fat that you encounter. 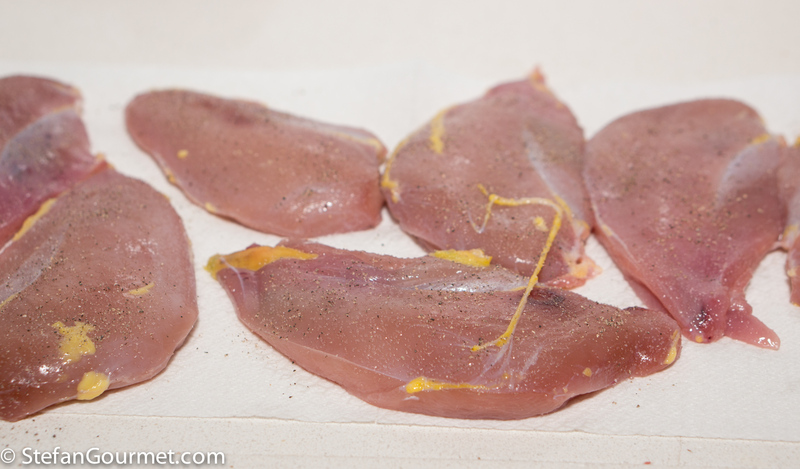 Season the breast fillets with salt and freshly ground black pepper. 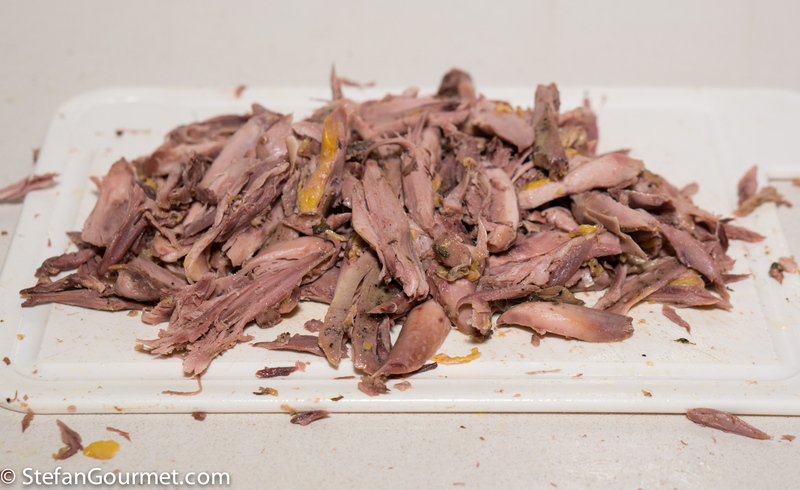 …until the fat renders out, then discard the crackling. 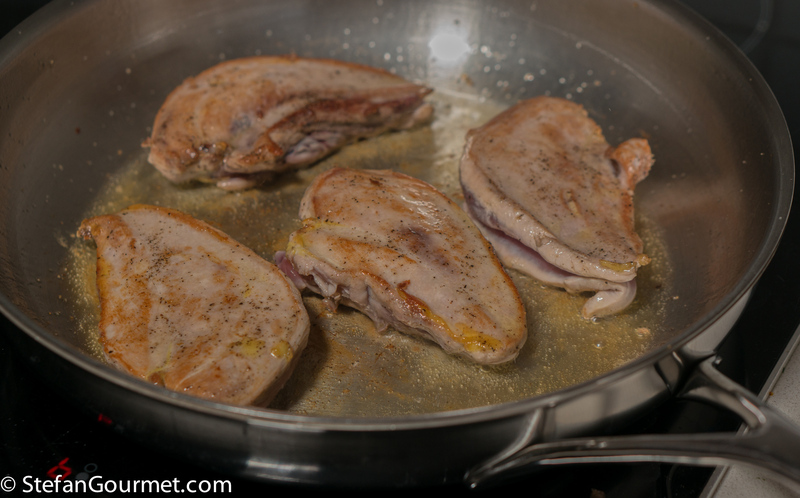 Brown the breast fillets over high heat in the fat for about a minute per side, then take out of the pan and allow to cool. 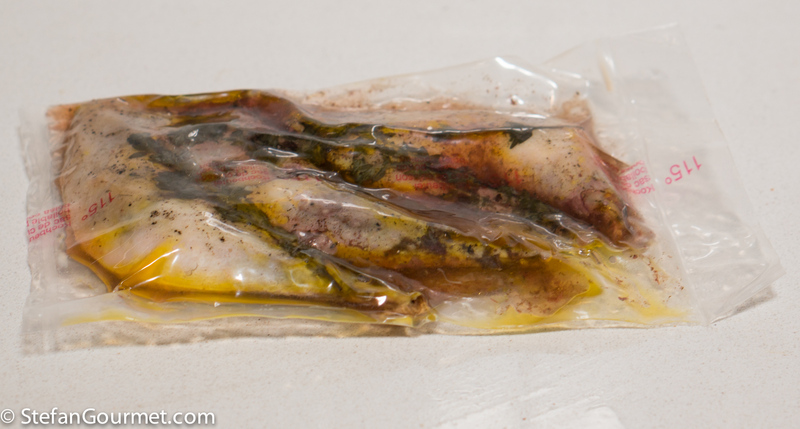 When cool, vacuum seal the fillets and refrigerate. 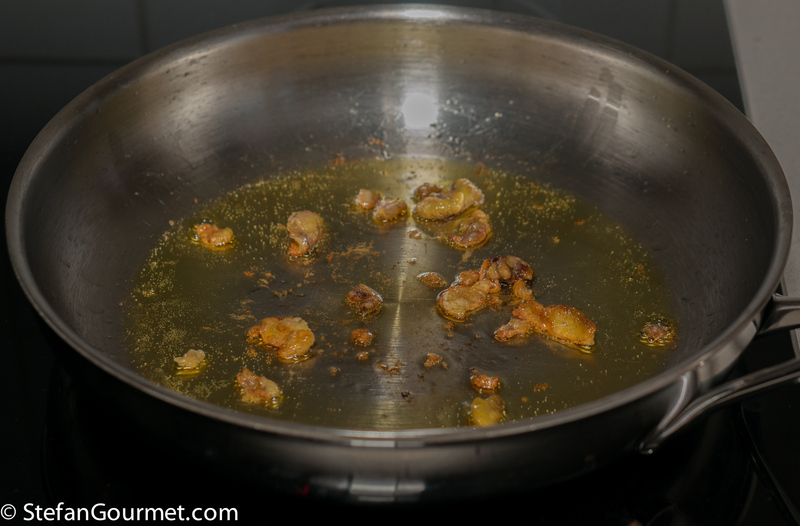 …which you should deglaze with some water and add to the stockpot later. …and vacuum seal them with some fresh thyme. Cook sous-vide for 18 hours at 74C/165F. In the meantime, make the stock. 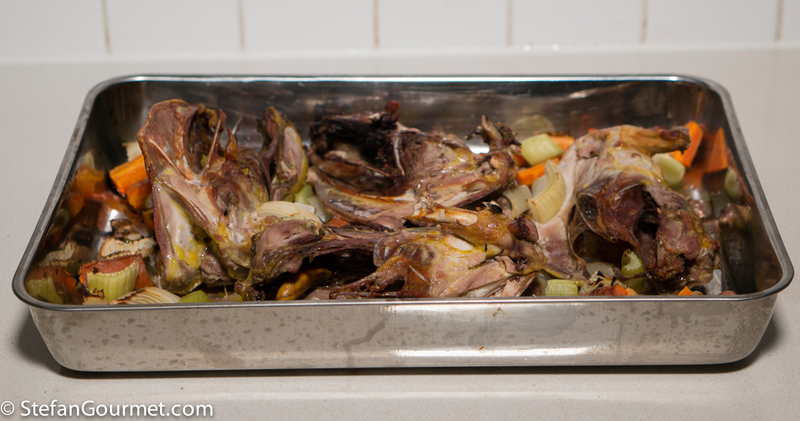 Roast the carcasses with carrot, onion, and celery in an oven-proof dish at 190C/375F for 30 minutes. Transfer the contents (including any juices!) from the dish to a stockpot or pressure cooker. 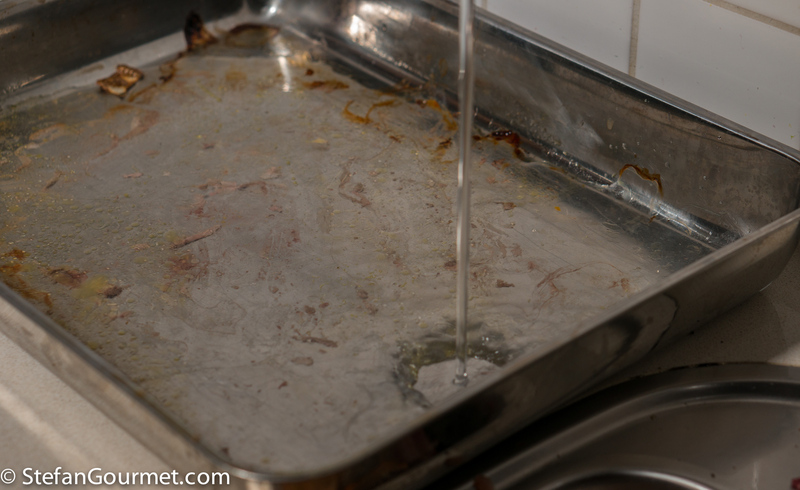 Deglaze the oven dish with water to make sure to include all the flavor. 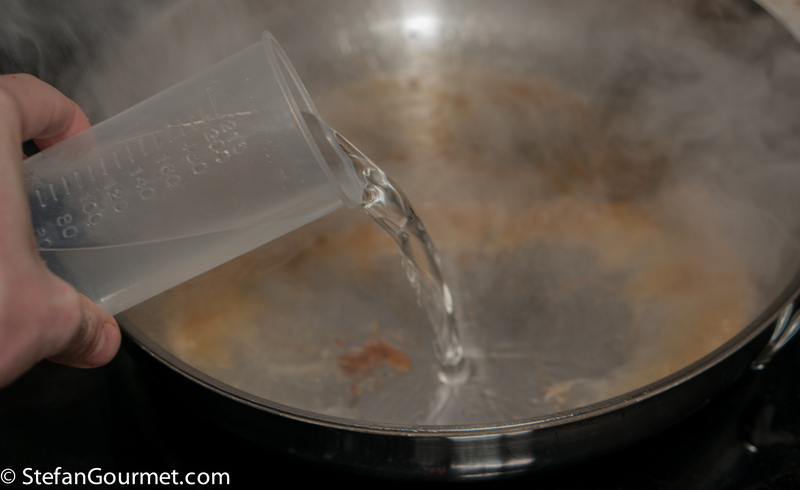 Add this water to the stockpot or pressure cooker. 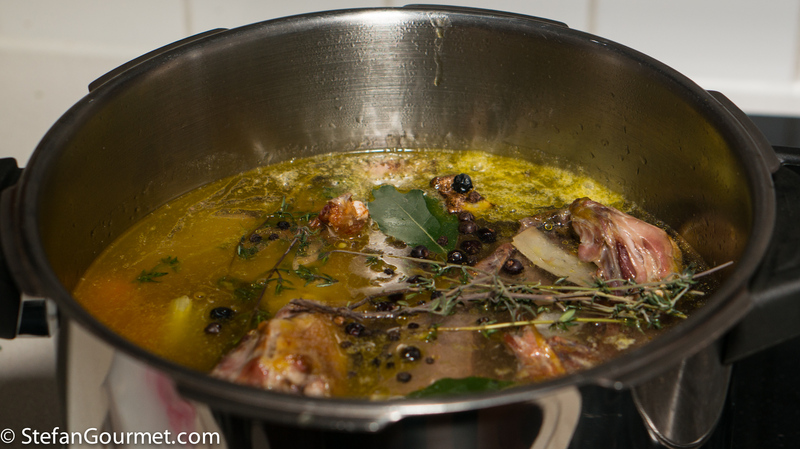 Add bay leaves, juniper berries, and thyme. 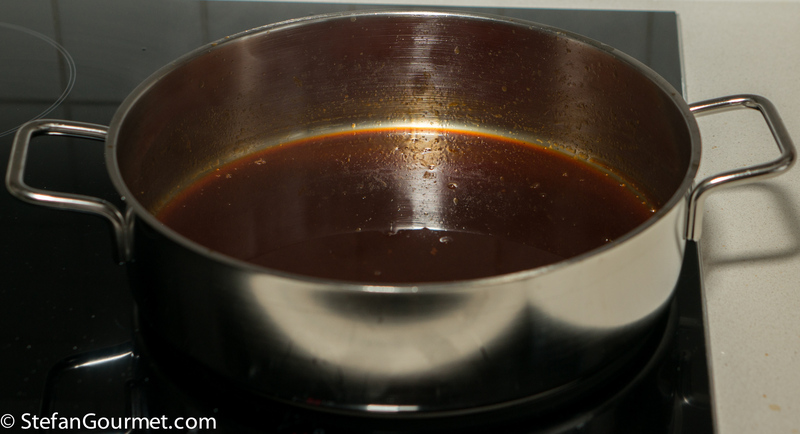 Bring to a boil and then simmer for 4 hours, or bring to pressure and pressure cook for 2 hours. Strain the pheasant stock through a fine sieve and discard the solids. 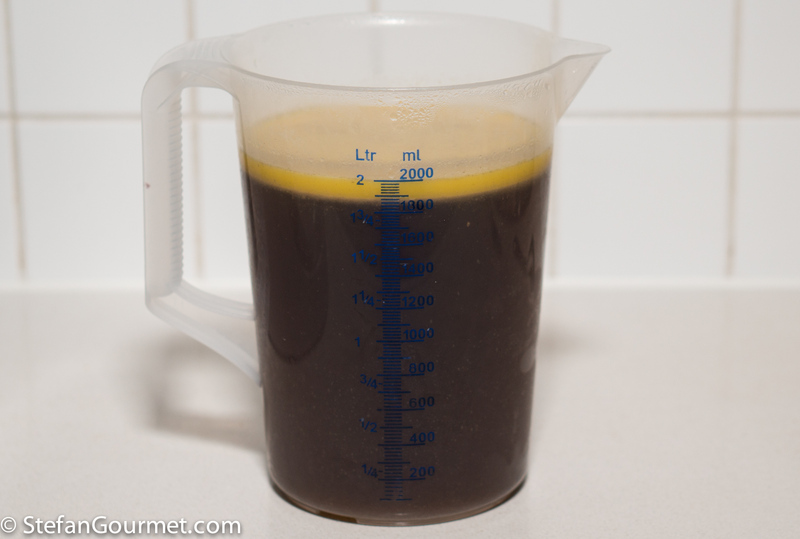 Bring the pheasant stock to a boil, then simmer to reduce to such an amount that it fits in a big measuring jug. 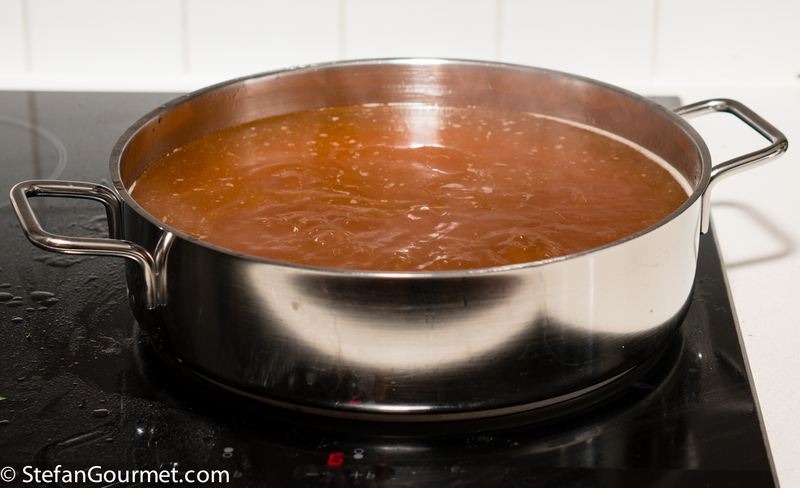 Put the stock in the measuring jug and allow it to cool (first to room temperature and then in the refrigerator) until the fat has solidified on top. Remove the fat with a spoon and reserve. 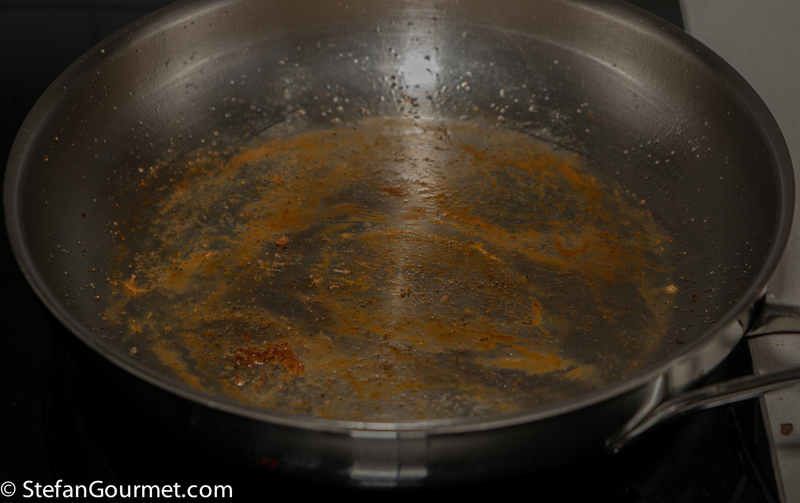 Continue to reduce the remaining stock until it is highly concentrated, but make sure it doesn’t burn. 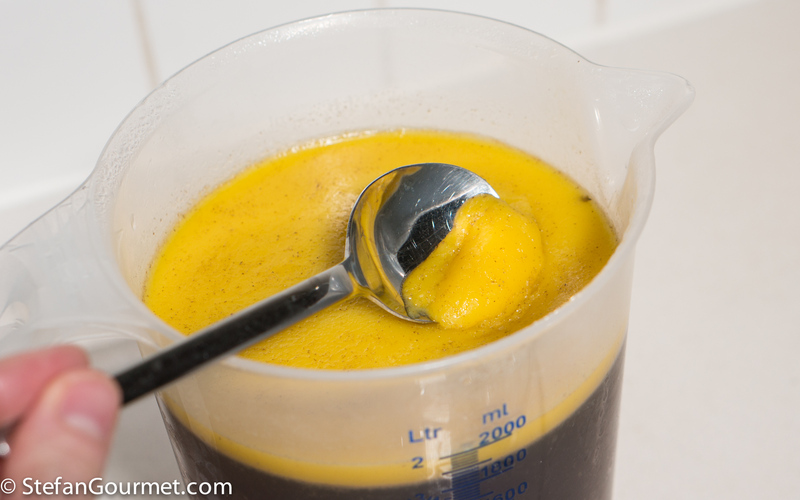 …and pour the juices from the bag into a saucepan. 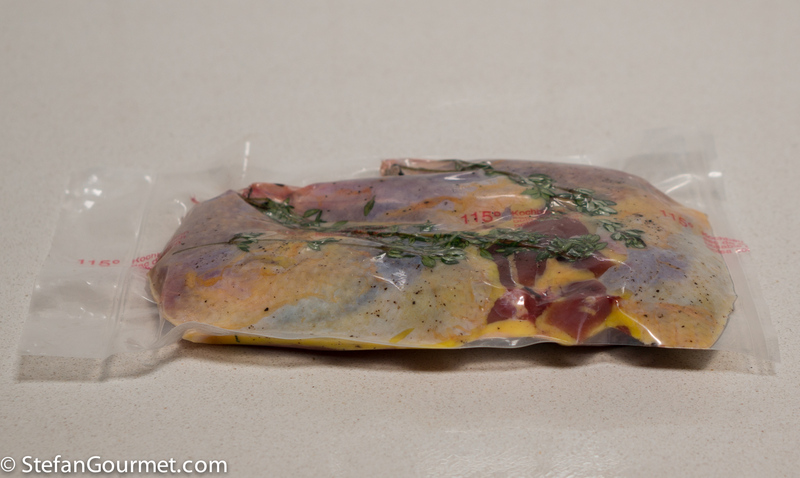 You can now lower the temperature of the sous-vide to 55C/131F (which is fastest by removing some of the water and replacing it with cold water) to cook the breast fillets. Cook the fillets sous-vide for 3 hours at 55C/131F. 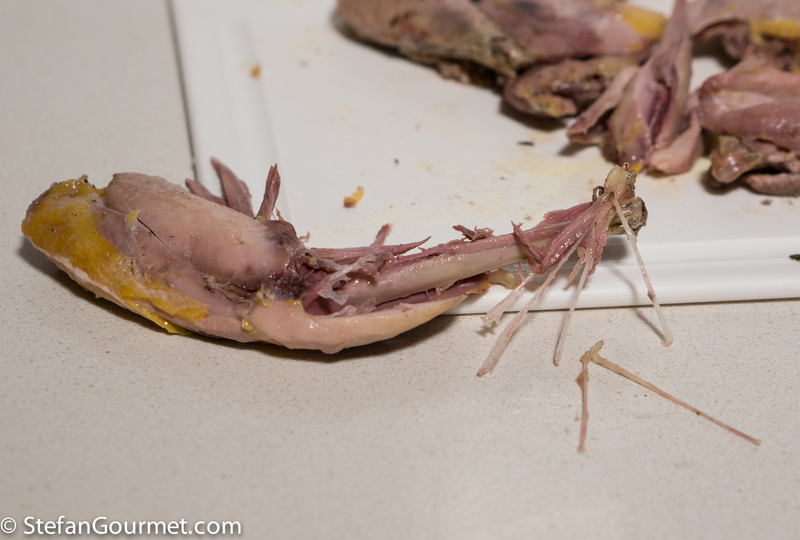 Remove the skin and thyme from the legs. Take the meat off the bones. Make sure to remove the many tiny bones that are in the drumsticks. 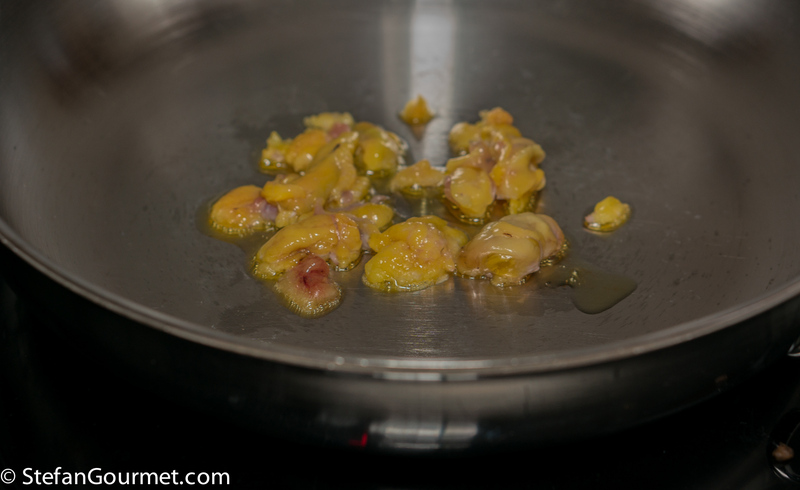 …and add it to the saucepan with the juices. 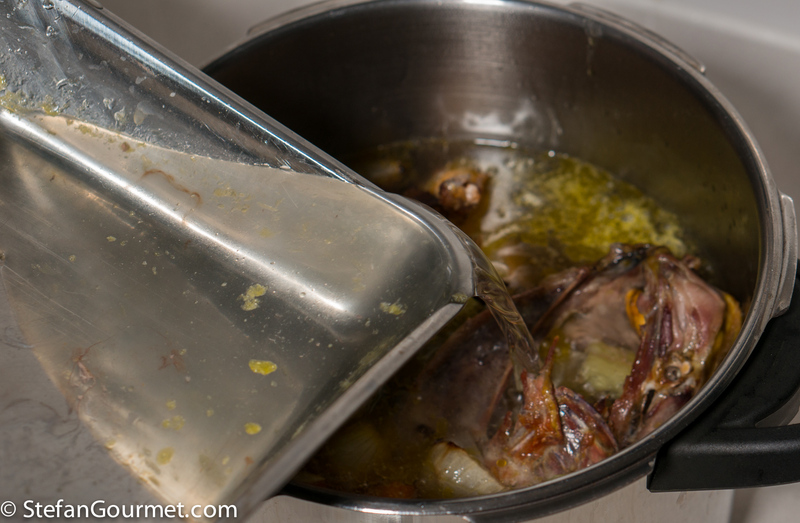 Add some of the reserved fat from making the stock as well. 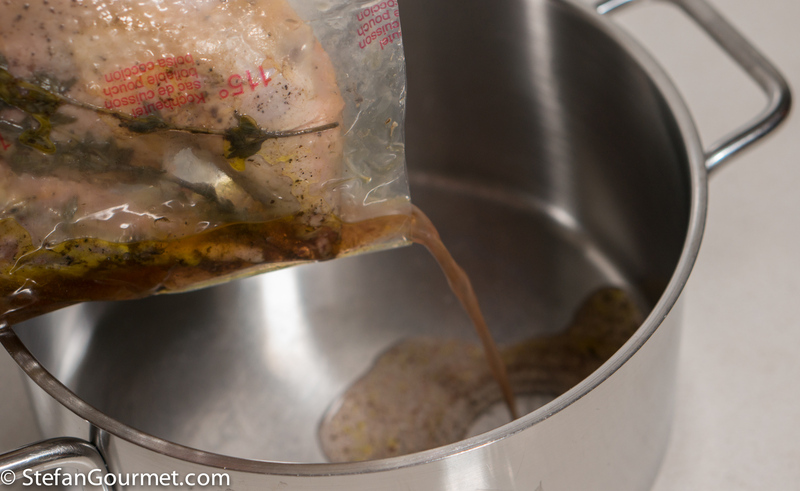 This will give the meat the flavor and texture of confit, without actually having cooked the meat submerged in fat. 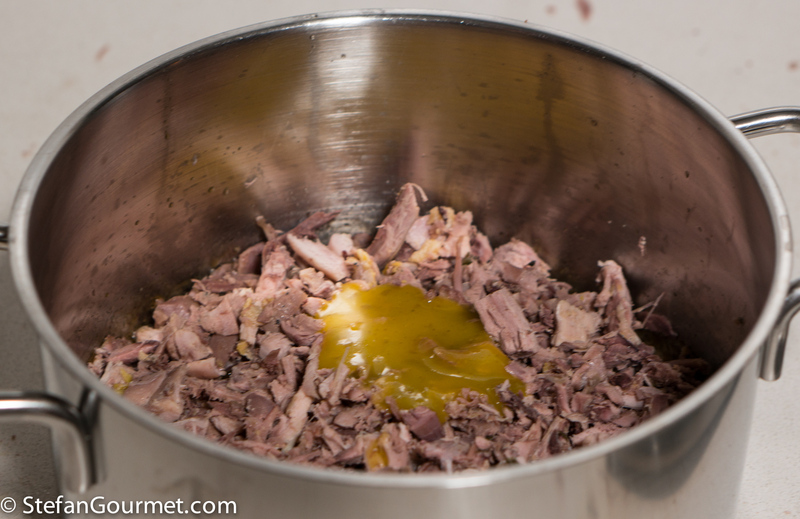 When you are ready to serve, very gently heat this mixture, stirring to mix the bag juices, meat, and fat. Taste and adjust the seasoning with salt and freshly ground black pepper. 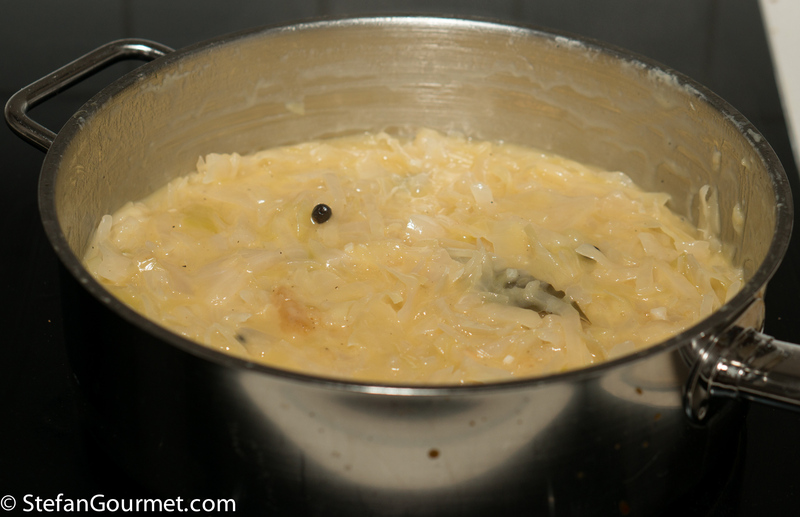 Prepare sauerkraut according to this recipe and using the reserved pheasant fat from the stock instead of the goose fat mentioned in the recipe. 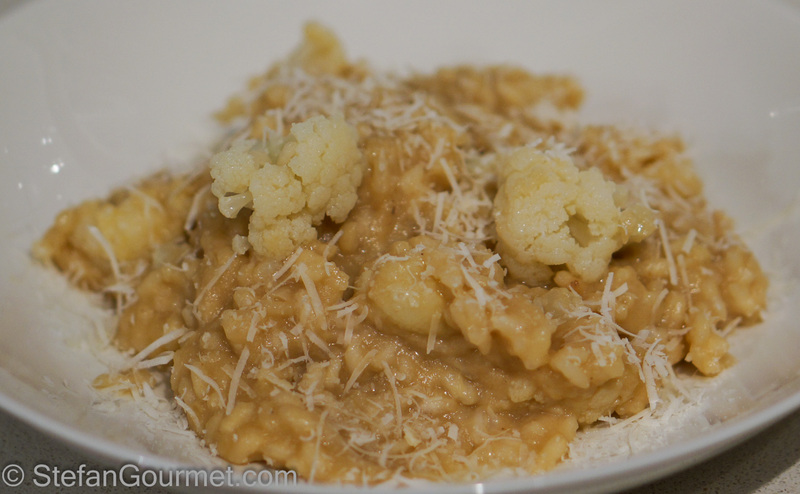 This cauliflower risotto is very nice because half of the cauliflower is pureed to give the risotto a full creamy cauliflower flavor, whereas the other half is kept as florets for an interesting look and texture. You make such impressive meals, I’m sure your guests really enjoyed this. I fagiani, assieme alle trote, sono uno dei miei tormenti! Come apro un cassetto del freezer ne salta fuori un paio! Devo provare questa ricetta! All of your food looks delicious. What a great way to prepare pheasant, Stefan. Your guests must have loved it! I envy that you’ve a choice as to how the pheasant got to your table. The one store that carried game meats — of which I was aware — no longer carries it at all. I’m hoping that this is a seasonal thing, that they needed the space for holiday turkeys. The odds are against me, though, I’m afraid. Great meal! I now have some pheasant breasts. I probably should have cut out the breasts but I thought it would be interesting to sous vide them as is. I see you sous vided the breasts for how i do chicken breasts – 3 hours at 131 degrees.. Would that be the same if the ribs are still attached? Thanks. Those ribs are pretty thin, so it doesn’t really make a difference in terms of cooking time. They’re still attached in the middle, so they’re not flat. Does that matter? As long as you can vacuum seal them, should be no problem. It was incredible. The texture was like filet. Tasted ore like a dark eat than a breast. 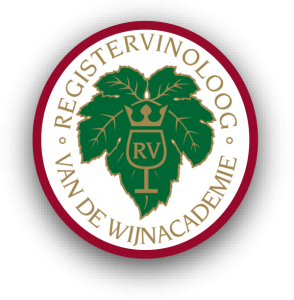 Excited to accept ore in the future! I think autocorrect messed up your comment somewhat 🙂 If the pheasant was wild, it makes sense that it was more dark meat, as wild ones fly more. 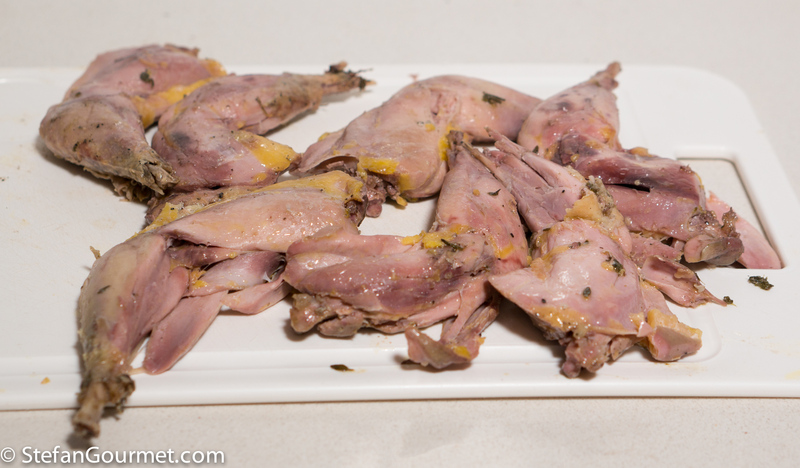 Great to hear it turned out well, because even with sous-vide pheasant can become a bit dry. Thanks! We followed your instructions for a Thanksgiving dinner with pheasant as the main course. It was unbelievably good. 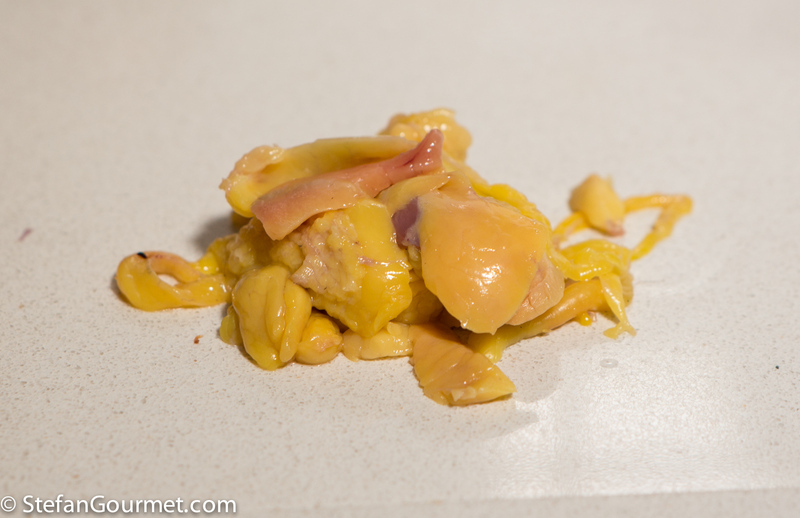 The confit part was very tender and adding back the fat got closer to the traditional confit than expected. Breasts were perfect. The reduced stock was all that was needed. I did add a nutmeg, ginger and clove mix to the sauce for complexity and switched potatoes Anna for the sauercraut but hey, it’s Thanksgiving and there were three other courses. Excellent guidance on your part. Thanks for reporting back! Great it worked out so well.